When we were planning Trevor's Lego party, he announced he wanted a cake that looked like a blue Lego with six bumps because he was turning six. I spent a long time thinking about how to make an attractive Lego cake. I did some Googling and found some amazing cakes from bakers far more talented than myself. I also found quite a few that made me cringe. My goal was to land somewhere in the middle. The awesome cakes all seemed to have one thing in common: fondant. I don't have the skills, tools, or patience for fondant (plus I hate the taste), so I knew I wanted to go fondant-free. But getting buttercream perfectly smooth is beyond my skills. So I got it in my head that an ice cream cake was the way to go. 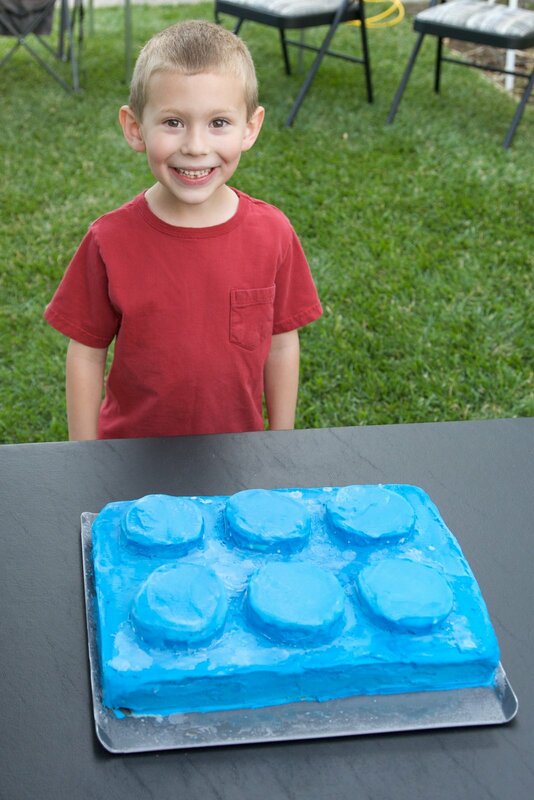 Here's the Birthday Boy with his Lego cake. And here's how we made it. Two days before the party, we made chocolate cake and divided the batter between two rectangular pans. This gave us two thin cakes, which was much easier than trying to cut one into even layers! (I set the timer for half the time and watched carefully for doneness.) When the cakes had cooled, we used a biscuit cutter to cut 6 circles from one of the cakes. Then we carefully wrapped the uncut cake and the six circles in plastic wrap and put them in the freezer. The next morning, we unwrapped the main cake, making sure to drape the plastic wrap over the sides of the pan. We spread softened mint chip ice cream in an even layer over the cake. Then we stuck it back in the freezer. When the mint chip layer was solid, we added a second layer of ice cream (mint chocolate cookie) on top. We covered it with plastic wrap and put it back in the freezer. When the ice cream was solid, we removed it from the pan and put it on a flat cookie sheet. We unwrapped the cake circles and used chocolate frosting to "glue" them to the cake. Back to the freezer. 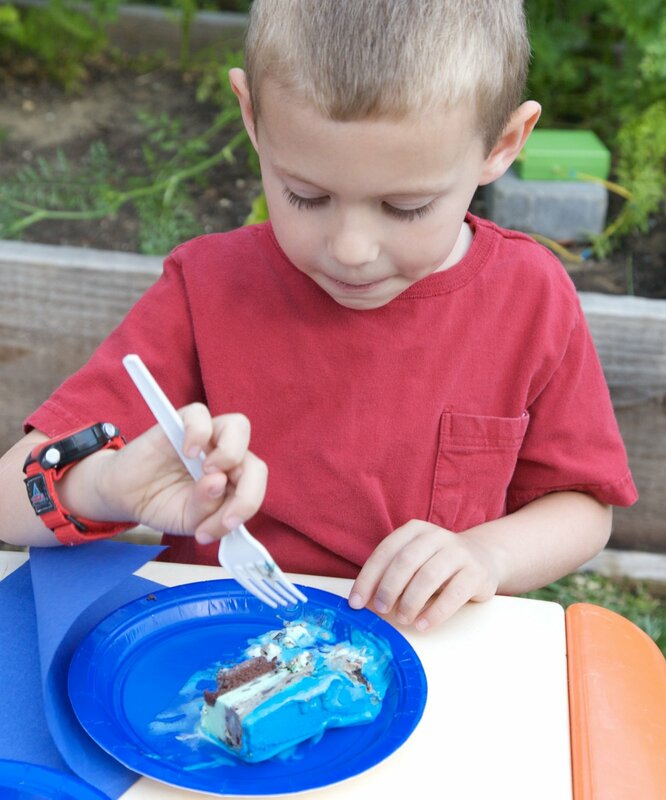 Then we softened vanilla ice cream and added enough food color to make Lego blue. We gave the cake a quick crumb coat. After that hardened, I did a final coat of blue ice cream over the whole thing. It was EXTREMELY frustrating because I had to keep returning the cake to the freezer every five minutes. Every time I got one area perfect, another area would start to melt and droop. Aargh! If I had access to a walk-in refrigerator or freezer, this cake would have been so awesome. But I don't, so eventually I decided it was good enough. Trevor thought it was "GREAT!" so I'm calling this cake a success. It looked pretty neat when we sliced it. We kept things far simpler for the party with his friends. I'd bought a Lego ice cube tray when we were at Legoland last year and it worked perfectly to make the chocolates on top of our cupcakes. We had quite a surprise when Trevor bit into his though... his tooth came out with it! That cake is AWESOME!! You ROCK!!! And YAYYYYYYYYYY for the lost tooth!!! Everything is fabulous....love the cake and the way it looks sliced is awesome. T is lucky to have a mom who will do her best to fulfill his wishes. The legos on the cupcakes is cute. Happy birthday T.
The cake turned out perfect!!! I really LOVE the chocolates on the top of the cupcakes too. Trevor is a lucky little boy! I love your Lego cake. It turned out great. And how smart to use the ice tray as a chocolate mold. I hope the tooth fairy left the birthday boy something extra special! Have you ever tried marshmallow fondant? I was afraid of it myself but it tastes great and was easy to make and work with.